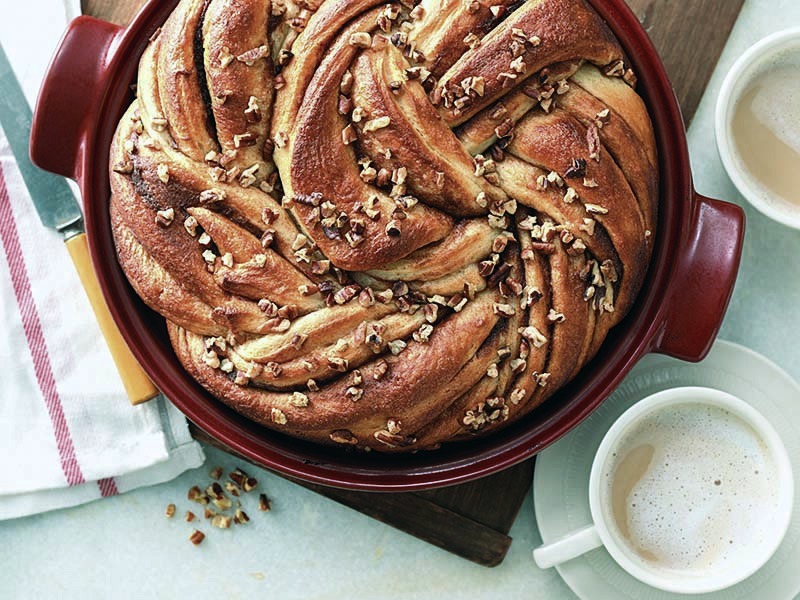 This elegant bread crosses the flavor of a cinnamon roll with that of a sticky bun. For the dough: Mix and knead all the ingredients together until you’ve made a smooth dough. Place in a lightly greased bowl. Allow the dough to rise, covered, at room temperature, until it’s nearly doubled in size, about 60 to 90 minutes. For the filling: In a small bowl, combine the sugar, cinnamon, ClearJel (or flour) and melted butter, mixing until the mixture is sandy-looking. Stir in the milk to make a paste; set aside. To assemble: Transfer the dough to a lightly greased work surface, and pat or roll it into a 24x10-inch rectangle. Spread the filling over the surface of the dough, leaving one long edge bare. Starting with a long edge, roll the dough into a log, then pinch the seam closed. Using a sharp knife, cut the log in half lengthwise, and turn each half so the filling faces up. Starting at the center and working toward the ends, twist the two halves together, keeping the cut side up. Form the twist into a coil and place it on a parchment-lined baking sheet or in a greased 10-inch round baking pan. For the topping: In a small bowl, whisk together the sugar and water together until the sugar is partially dissolved. Drizzle it over the top of the bread and sprinkle with the pecans. Cover loosely with greased plastic and let rise for 45 minutes to 1 hour, until puffy. While the loaf is rising, preheat the oven to 400°F. When the loaf is risen, bake for 40 to 45 minutes, until golden brown. Tent loosely with foil after 25 minutes if it’s browning too quickly. When done, the bread’s center should read 195°F when measured with a digital thermometer. This was a great loaf. I added chopped apples. Yum we ate the almost eat the whole thing in one night!